Wang Jiangwei spent last summer sweating through a month of military drills—everything from marathon runs to rigorous calisthenics—conducted by Chinese People’s Liberation Army instructors. But Wang isn’t a soldier; he’s a researcher at Great Wall Motor (2333:HK). The training program is a creation of Great Wall’s quirky founder, Chairman Wei Jianjun, who has built China’s biggest maker of SUVs with a leadership style that stands out for its emphasis on discipline and frugality usually more common to the military. Training isn’t the only area where Great Wall marches to a different drummer. Big Chinese rivals such as FAW Group and SAIC Motor (600104:CH) often team up with foreign automakers, including Volkswagen (VOW:GR) and General Motors (GM), tailoring their models to affluent Chinese drivers’ taste. But under Wei, Great Wall has mostly developed homegrown products on its own aimed at China’s masses. That allows it to operate without splitting profits or enduring the extra bureaucracy of joint ventures. Car experts take the entrepreneur seriously. “If there are one or two automakers able to survive all the competition with foreign rivals in the next decades or so, Great Wall will definitely be one of them,” says Bill Russo, formerly vice president of Chrysler Northeast Asia and now president of automotive consultant Synergistics in Beijing. He says the company could become the next Hyundai Motor, which has grown from a modest maker of cheap cars into a full-line global manufacturer. Wei has begun bolstering Great Wall’s research capability to develop the sophisticated engine and propulsion components he’ll need to become a player outside China. He wants to double sales to 1.3 million vehicles by 2015. His longer-term goal: to outsell Chrysler Group’s Jeep brand globally. Great Wall lacks the revenue heft of many major rivals because its cars are far cheaper: Its Haval H5 SUV costs 92,800 yuan ($15,124), a fourth the cost of an Audi (NSU:GR) Q5 built in China. But the SUV specialist’s low costs—in part because of cheaper plant equipment and minimal research and development in the past—have given it rich operating margins that beat even lucrative outfits such as Fiat’s (F:IM) Ferrari sports car unit. 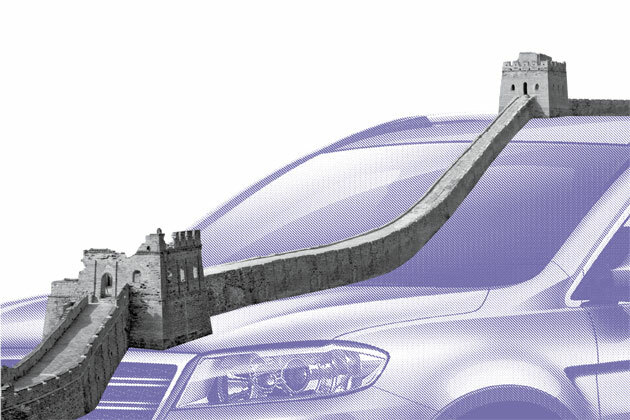 Great Wall will probably lead all automakers’ margins globally this year, at 16.4 percent, says Max Warburton, an analyst at Sanford C. Bernstein (AB). The company’s net income had been expected to rise 24 percent, to 7 billion yuan, this year after surging 66 percent in 2012, according to an average of 16 analyst estimates compiled by Bloomberg. But the company on July 23 told Hong Kong’s stock exchange that net profit for the first half of 2013 rose 73 percent on strong sales and expanding margins. Wei, born in Baoding in 1964, says he was greatly influenced by his father, an artillery soldier who went on to make boilers. After several factory jobs, Wei took over a small car-modification business at age 26 and turned it into a van maker. He shifted focus to pickup trucks after seeing their popularity in Thailand. Small business owners and farmers favored Great Wall’s Deer, making it China’s most popular pickup by 1998. Then antipollution laws limited truck use in major cities, prompting Wei to switch to SUVs. Today, SUVs make up nearly half of Great Wall’s sales—and for the 11th year it’s poised to lead China’s crowded SUV market, its auto industry’s fastest-growing segment. Russo recalls that during a trip Wei made to Chrysler’s headquarters in 2008, he was asked by Thomas LaSorda, then Chrysler’s chief executive officer, why Great Wall didn’t join Chinese carmakers in showcasing vehicles at the Detroit auto show. Wei replied the company wasn’t ready, Russo says. “They don’t try to overreach,” he says. Wang says five years ago she opposed the rollout of the Gwperi subcompact endorsed by Wei. He overruled her—only to see the car flop after buyers found it too small and pricey. The debacle is engraved in red on Great Wall’s two “Boulders of Shame” in Baoding; one lists major product failures, and the other identifies four officials who’ve been jailed for accepting bribes. Wei has other eccentricities, according to Zhang Yun, an outsider who’s advised him for five years on marketing. The billionaire is so frugal he smokes 10-yuan-a-pack Zhongnanhai cigarettes. He once scolded some dealers for leaving too much food after a meal. He sleeps most nights in a room next to his office. Chinese carmakers are a decade away from delivering their first globally competitive vehicle, Warburton says, but that’s only one or two product cycles in the auto industry. Great Wall’s H5 drives well, he says, yet suffers from “truly awful” vibrations in its gearbox and poor braking. But the newer H6 model shows a “massive leap forward” in quality, according to Warburton. The bottom line: Great Wall Motor, China’s No. 1 SUV maker, has operating margins of 16 percent. That’s the highest of any carmaker.